Earlier today I went by to visit a lady, a member of the church where I minister, who has been in the hospital for a few days. She told me that the doctors believe she has pancreatic cancer. Though she accepted that as well as I suppose anyone would, I could also see the concern. There’s nothing I can do except to say “I’m sorry”, pray with he and for her, and be in some way, a presence of God as I visit with her as a minister and brother in Christ. I wish there was more that could be done…we all do. Sometimes I think the hardest part about living in a space and time where there is life and death, is knowing that the day of the new heaven and new earth joined together in the full presence of God is coming (cf. Rev 21.1-8). Don’t get me wrong, to have this hope is the greatest. But when you long for faith to become sight, it’s tough to wait in patience…especially when the fragility of life is ever present. What we need and what we take comfort in is that in life and death, God does abide with us. Henry Francis Lyte, “Abide With Me,” performed by Libera. Reverend Shaw Moore was the fundamentalist preacher played by John Lithgow in the movie Footloose. Though fictitious, Reverend Moore, preaching against dancing and rock music, stereo-typifies much of traditional American Christianity rooted deeply in Puritan values. Without saying so in words, his church preaches a loud and clear message: check your sin at the door, because God wants nothing to do with sinners. There was another time in history when some of God’s people, by in large, believed this too. However, Jesus believed differently and routinely shared the dinner table with the sinners, the unclean. It resulted in him being accused of being a glutton and a drunkard. Jesus said, “The Son of Man came eating and drinking, and you say, ‘Here is a glutton and a drunkard, a friend of tax collectors and sinners’” (Luke 8.34, NIV). This accusation is a quote from Deuteronomy 21.20 regarding the rebellious son that will not obey his father. So beyond being accused of being a glutton and drunkard, a friend of tax collectors and sinners, Jesus is actually having a legal charge brought against him that carried the punishment of being stoned to death. That’s the way of Jesus. That’s the sort of church Jesus had in mind when he first called a group of fishermen to follow him. It’s a church who’s love and hospitality for the sinner runs so deep and wide that the church is at risk of even being accused participating in the said sins. That’s a reminder to us that if we want to participate in the gospel mission that makes unclean people clean once again, we must be willing to become the church of “gluttons and drunkards” by loving without judgment and extending hospitality without reservation to all sinners. This post was published as a bulletin article for the Randolph Church of Christ on Sunday, July 10, 2011. Here is a sermon preached on Sunday, June, 26, 2011 at the Randolph Church of Christ by Donato Daddario, a member of the congregation who, in my absence, spoke a word from God on forgiveness. In the last two posts (here and here), I have discussed the fruit of faith, love, and hope that is produced by the true gospel. In this post, I simply want to relate this discussion to the task of evangelism. As Christians, our greatest testimony that the gospel of Jesus Christ is true is a life lived in faith, love, and hope. At times, Christians have been led astray to think that our biggest evangelistic tool was debates, syllogistic reasoning, and topical Bible studies. The truth is, if we’re honest enough to admit it, these methods weren’t about evangelism, that is, winning people to Jesus Christ. Rather, these methods were about proving we were right…especially when it came disagreements between two or more denominations over various issues. Yet in all of that noisiness that was said to be evangelism, more and more people have been saying no to Christianity. I am convinced that what they have been saying no to is not Jesus Christ but rather a version of Christianity that they are smart enough to sense as being a much different way of life than that of Jesus Christ. 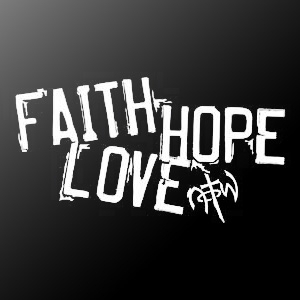 Faith, love, and hope is more than just a belief, it is a way of life and I’ll repeat my self and say that the greatest testimony that the gospel of Jesus Christ is true is a life lived in faith, love, and hope. So from an evangelistic quest I still believe that there will be times when it is necessary to have “Bible studies” with people, however I also believe that what must proceed Bible study is relationship or community. We need to be in relationship with people where they can see our faith, love, and hope being lived out in real time. This is done when we create and enter spaces for community…small groups, dinner-table time, gathering events (i.e., birthday parties for children). This is where we build relationship and shine the gospel light that is our faith, love, and hope. With faith, love, and hope, if we invest in this relationship building then there will be time for Bible studies that teach the gospel. If not, then the truth is that we’re just not interested in evangelism and ultimately, not interested in a life of faith, love, and hope. In my last post I discussed how the true gospel is evident by the fruit it is bearing: faith, love, and hope (Col 1.3-8). Now I want to share why this ought to be an unnerving jolt to some Christians and I might just irritate a few nerves on some people :-). The Apostle Paul was able to evaluate the presence of the true gospel by the triad fruit of faith, love, and hope being produced. But that is not the typical way many Christians go about evaluating the presence of the true gospel today. Evaluations are based upon a laundry list of doctrines and issues, to which others must agree upon or else they are judged not to be true Christians…“New Testament Christians”. Yet we all know of churches and Christians who make such foolish judgments, claiming to be the only faithful Christians (often referring to all others simply as “religious people”) but who exhibit very little (if any) faith, love, and hope in the biblical sense of those words. This is not only regrettable but unbiblical as well and is cannot be tolerated nor will it be tolerated. People are growing weary of churches who blow smoke by claiming to have the truth, to believe in the the true gospel, but show no signs of faith, love, and hope. These people will not be fooled. The only people who are being fooled one’s who think they can blow smoke and pass it off as the true Gospel. If we say we believe in and uphold true gospel of Jesus Christ, scripture is telling us that it ought to be evident in the triad of fruit it’s bearing: faith, love, and hope. If there is no such fruit evident then maybe we ought to seriously ask if we’ve really heard the true gospel. Yesterday I began a new sermon series at the Randolph Church of Christ on the New Testament book of Colossians. I began with the thanksgiving section of Paul’s letter, Colossians 1.3-8. Paul is expressing his gratitude because of what he has heard from Epaphras concerning the Christians in Colossae. Namely, what Paul has heard is that the gospel is bearing fruit among them just as it is doing elsewhere around the world. Bearing fruit. That’s great news. That’s what every missionary, pastor, and preacher wants. That’s what every church would like to think…that the gospel is bearing fruit among them as it is doing elsewhere. But the fruit Paul is speaking of is faith and love springing from the hope they now have as a result of the gospel. This is where things take a very fast and furious unexpected turn. That’s because the triad of gospel fruit–faith, love, and hope–is not abstract philosophy nor is it about having all the right beliefs when it comes to Christian doctrine. As one commentator rightfully put it, to have hope is “…to participate in the new redeemed life that is coming and is present in the sphere of Christ” (Marianne Meye Thompson, Colossians and Philemon, 21). Therefore, faith and love is the expression of participating in this new life in a way that is completely committed to the way of Jesus Christ (who lived this life himself). I don’t believe that ignorance is bliss or that being ardent students of the Bible and striving for sound Christian doctrine are unimportant endeavors. But I am becoming more and more convinced that having the right beliefs on a select list of Christian doctrines is the most important priority to being faithful Christians. In fact, I really question how much such tasks have to do with being a faithful Christian in the first place. What seems to matter is that we believe Jesus Christ as the one who “has rescued us from the dominion of darkness and brought us into the kingdom of the Son he loves, in whom we have redemption, the forgiveness of sins” (Col 1.13-14) and live a life committed to that belief which is to live a life of faith, love, and hope.